Give your poetry some sizzle and sparkle with this audio/visual resource. Different colors bloom like flowers in the sky luminously.They brighten up the sky like Diwali lanterns.People scream excitedly at this event.The fireworks sound like thunder which are ear-piercing to animals.What a stunning view!!! Stimulating-love the sound effects. Thank you. Multi – colored fountains Enchanting the sky ; Like a big BANG ! Composing a cardinal , amethyst , cascade Of lingering galaxies , till nigh . Luminous spirals prance into space ; Separating and gliding – who will win the Race ? remember remember the 5th of november bonfire night the sky is bright fireworks shoot in the sky sparkling bright and twinkling way up high sparklers a lit everyone gathers round soon there is a big crowd bangers and mash made for dinner in a flash now its bedtime i still hear the fireworks booming outside “Goodnite” my mother calls as the last firework falls zzzzzzzzzzZZZZZZZZZZ!!! This is just what I need. 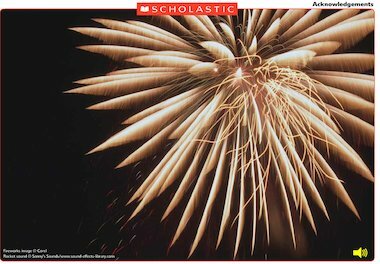 Brilliant resource to stimulate discussion and ideas for writing descriptive sentences about bonfire night. Great for senses poetry unit. Excellent will be using this next week to introduce poetry. This is very good for unit 1 poetry about the senses. You can talk about what you can hear and see and come up with a bank of interesting words for the children to use. I am going to use this, as it is bonfire night next week.